Last Tuesday, as part of CSAE’s weekly seminar series, James Fenske presented his new working paper on ‘War, Resilience and Political Engagement in Africa’ (co-authored with Achyuta Adhvaryu) in which they test whether early-life war exposure influences later-life political engagement in Africa. Their evidence comes from combining data on the location and intensity of conflicts since 1945 with Afrobarometer data on political attitudes and participation from 17 sub-Saharan African countries. After presenting a large number of regression models, specifications and robustness checks the authors conclude that childhood exposure to armed conflict does not have an impact on political attitudes and participation. Papers that centre on non-results are difficult to sell, as economic journals have a strong bias towards publishing research that ‘proves’ or ‘disproves’ a particular hypothesis. Given that there is a lot of micro evidence on the impacts of conflicts on health, education and political participation outcomes, this non-result is surprising. It may be due to data quality or estimation (identification) issues. However, I think that the authors have been careful in their construction and examination of their cross-regional dataset and find their non-result believable. One issue I have is with their title and definition of ‘war’. They do not restrict their analysis to wars, as their title suggests. Typically this literature defines ‘wars’ as conflicts resulting in more than 1,000 battle related deaths per year. Their definition is broader and includes all armed conflicts in the 17 Sub-Saharan countries that they are able to include in their study. They include conflicts in Botswana and Tanzania, typically perceived as peaceful countries. On the other hand, wars in the DRC, Ethiopia and Sudan are excluded (due to lack of data on political attitudes and participation). I would like to see more informative descriptive statistics and a discussion of armed conflict in Sub-Saharan Africa. Aside from definitional issues, their non-result may be the consequence of asking a non-relevant research question. However, I do think that the authors are posing an important question because it may us help to understand how we can break conflict traps and make the world a safer place. Ach and James’ paper appears to contradict the recent research by Tim Besley and Marta Reynal-Querol. These authors suggest that historical conflicts have long lasting effects: African countries and regions with pre-colonial deadly conflicts are more likely to experience armed conflict today. 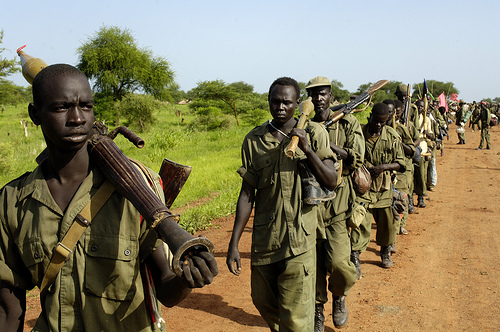 Countries experience long lasting conflict traps of recurrent cycles of violence. According to Ach and James this appears not to be the case: an individual’s past does not shape his/her political views and participation. Individuals that experienced conflict in childhood are no more likely to engage in conflict. However, I would argue that certain attitudes and participation patterns do not guarantee peace, because attitudes do not always translate into the actions we would expect. One example is the CSAE work on Kenya’s 2007 election voting behaviour and subsequent violence. More research on the link between attitudes and action is needed. But how do we square the empirical observations of the high frequency of recurrent conflict and Ach and James’ suggestion that individuals are resilient and no more likely to take up arms after experiencing conflict in childhood? Certain regions may be more conflict prone over the course of history because of the resources that can be extracted from this region, not because of the individuals who live there. The organisation of large scale violence requires resources, not just ‘attitudes’. Geography, settlement patterns and institutions are all interrelated and shape the risk of (recurrent) conflict. Thus, conflict risk may not be down to individuals’ attitudes over the course of their lifetime but the region’s geography, migration and institutions. If it is correct that in general attitudes shape our actions, the message from Ach and James’ working paper can be interpreted as a very positive one: it suggests that we can escape the conflict trap; conflict does not beget more conflict. Steven Pinker in his book on violence summarizes a lot of evidence showing that the world today is much less violent than it has ever been. His concept of violence is broad and includes wars, homicides, torture, racial hate crimes and gender based violence. Pinker argues that throughout history there have been ‘civilizing’ efforts, resulting in a reduction of violence. His examples are based on evidence from rich countries, mainly because they have seen the largest reduction in the levels of violence. However, if the story by Ach and James is true, it is likely that there is an underlying ‘civilizing’ process, reducing violence in these 17 African countries. What is this ‘civilizing process’? Is it home grown or an ‘imported’concept? How can it be strengthened ? These are potentially interesting questions for future research. This entry was posted in Institutions and Growth and tagged Conflict, Development, Institutions, Politics. Bookmark the permalink.